Kingfisher Press are delighted to be one of only 12 of Carbon Balanced Publication Printers in the UK. A Carbon Balanced Publication Printer is one of the highest statements of environmental integrity and credibility for both the end user and those who provide paper based communications. It confirms that the carbon impacts of the whole production of a printed item has been estimated and balanced (offset). The accreditation recognises excellence in environmental performance across the entire spectrum of a company’s operations and services. This prestigious accreditation demonstrates commitment to the environment by assessing and calculating the corporate carbon footprint. The resultant carbon emissions are carbon balanced (offset) by ecological charity, the World Land Trust, by preserving endangered tropical forests that would otherwise be removed. 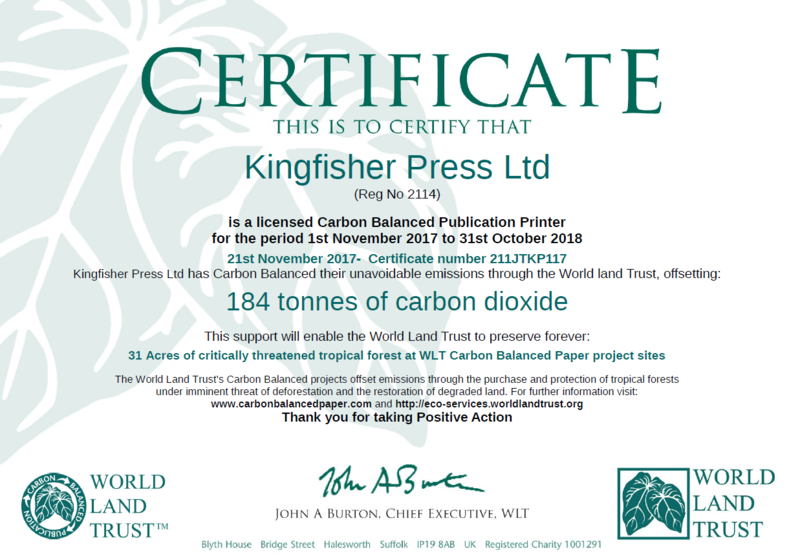 Carbon Balanced Publication Printer is just one of Kingfisher’s green credentials, Kingfisher Press are already FSC® accredited and also have the ISO14001;2015 Environmental Management System accreditation. Would you like to find out more about carbon balanced stocks? Read our blog here or contact us now to find out more information. Kingfisher Press Ltd are a fully certified ISO14001:2015 accredited printer. The ISO14001 accreditation provides a framework for organisation policy, planning and actions to meet internal and external environmental management objectives. It addresses the management of environmental aspects and results in continual improvement of environmental performance. ISO14001 focuses on helping organisations grow while reducing their environmental impact, helping to achieve sustainable success. ISO14001:2015 means Kingfisher Press are committed to assessing and improving their environmental objectives. This will include purchasing new equipment and developing processes and working methods that will improve our environmental performance. The accreditation demonstrates that as a business we recognises our impact on the environment. It shows we have introduced measures to reduce that impact on an on-going basis. Our clients can demonstrate they are committed to using environmentally conscious suppliers who are concerned about the environment. FSC® runs a global forest certification system with two key components: Forest Management and Chain of Custody certification. This system allows consumers to identify, purchase and use wood, paper and other forest products produced from well-managed forests and/or recycled materials. 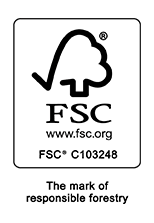 You will see FSC® certification badges on all kinds of wood products from paper to garden furniture. The FSC® is dedicated to promoting responsible management of forests and offers a chain of custody from forest to end user ensuring every step of the products manufacturing life cycling is traceable. The Forest Management certification ensures the wood comes from sustainable forests which fulfil economic, environmental and ethical criteria. All the paper stocks Kingfisher Press works with are FSC® certified ensuring we only work with material that is from a sustainable, ethical source. Read the FSC® factsheet about Printed Materials here. To find out more about FSC® click here – or to download a copy of the FSC® Chain of Custody Factsheet click here. As part of our Environmental Management System Kingfisher Press recycle and reuse where we can. Approved Waste Management companies dispose of any product that cannot be recycled or reused. We use low-chem equipment and regularly promote environmentally options to clients such as Drip Off – which is an environmentally friendly option to Spot UV and water based seals such as Aqueous Coating. Aqueous (water-based) coatings have minimal VOC (Volatile organic compound) content, reducing atmospheric pollution. Printed material with aqueous coating can easily be recycled to lower grade paper and board. The coating itself can be cleaned from our presses using pure water or products with low VOC content rather than solvents.Water-based coatings are formulated from inert raw materials so they do not decompose to form environmentally dangerous products. Looking for a cost effective alternative to Spot UV? Check out drip off varnish. Want the latest updates from Kingfisher Press? Join others and follow our blog. If it's BIG we print it. Everything from large canvas to exhibition displays.